At ArtsCow, online at ArtsCow.com, you’ll find countless photo printing options that will allow you to make perfect gifts. ArtsCow either lets you buy and print photos or make photo gifts for your loved ones. Make things at ArtsCow such as photo books, photo bags/cases, canvas/prints/posters, cards and stationary, clothing and accessories, buttons/magnets and stickers, jewelry and watches and things for your home and office. You’ll even find a digital scrapbooking program with ArtsCow. So check out ArtsCow to see what perfect gift you can make next. Remember to stop by RetailSteal to find the best ArtsCow coupon codes, ArtsCow promotions, and ArtsCow discounts. Most orders with ArtsCow are shipped via Standard Shipping and the price is based on the type of item that you purchase. You can also select FedEx Shipping Service for additional fees. International shipping is available. See website for full details, exclusions may apply. Head over to ArtsCow online today and use our coupon code to save 35% on all non-prints purchases. Click here to shop. Enjoy free shipping on your order from ArtsCow when you use this coupon code online. Use code on orders of $15+ to qualify. For a limited time only, enjoy a 30% discount on your personalized photo gift purchase from ArtsCow.com. Click link to shop. Use this coupon code at ArtsCow and receive 25% savings on personalized photo gifts. 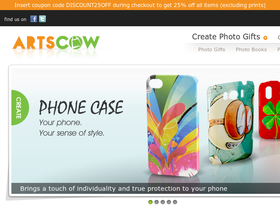 Shop Artscow.com and enjoy 25% savings on your purchase using this coupon code. Click link to shop. Get free shipping at ArtsCow for all orders over $20 using the coupon code. Click link to save. ArtsCow offers up to 80% savings on print products. Click link now. Act now and take advantage of a 6 x 6 photo book for just $3.99 with this promo code from ArtsCow.com. New ArtsCow members get 1200 free prints from ArtsCow! Click here to get started today. Save 40% on all Halloween merchandise this season at ArtsCow. Shop online for great deals today! Save 30% when you order non-prints items from ArtsCow and use this promo code with your order! Use this coupon code today to get free shipping on your order of $29+ from Snapfish. Act now and get free shipping on an 11 x 14 unframed canvas print from Snapfish.com. Use code at checkout to save. Use this code to get 8x11 hardcover photo books for $10 each + free standard shipping from Snapfish.com. Get your photo gifts with Snapfish online for up to 75%. Check out Snapfish.com for their latest special offers.